This is another one of those retrospective blog posts. Since I’ve been writing up trip reports on a few recent outings, it seems like a shame to not have one for some of our more noteworthy trips in the past. Plus, I wanted this blog to partly be a resource for others to find inspiring, fun destinations to explore and ideas for adventure. Not too mention, on this particular trip, I made one of my first GoPro videos that actually turned out half-way decent! Curtis and Mark joined me on this trip. 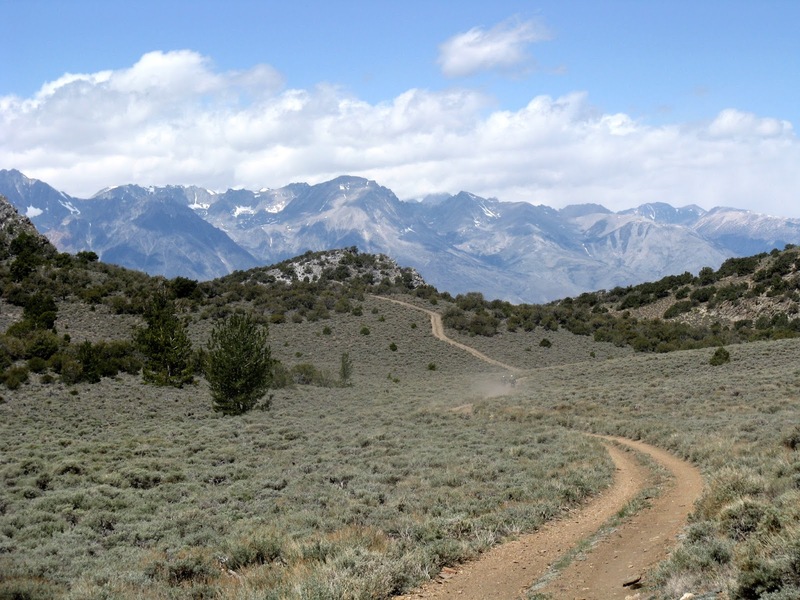 Our ride went up Mazourka Canyon and into the Inyo Mountains. 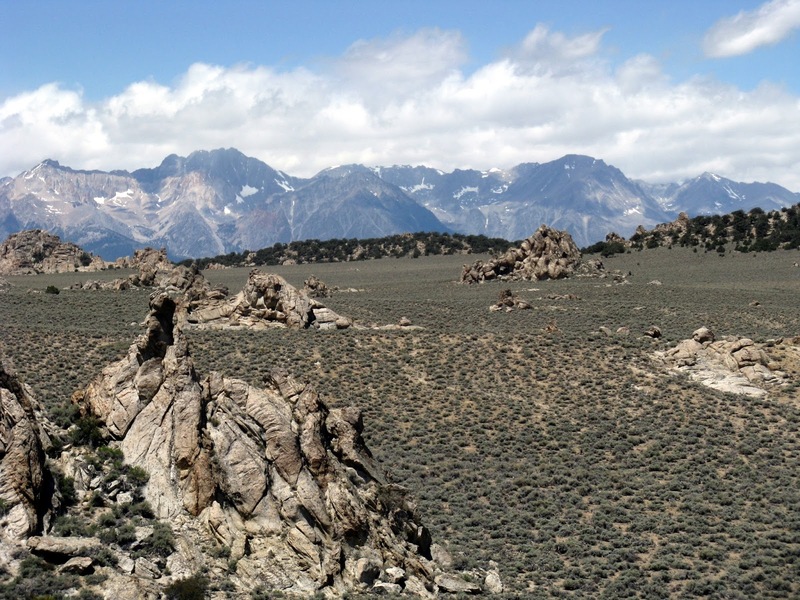 Inyo comes from the Owens Valley Paiute, which means “dwelling place of the Great Spirit”. * We slowly made our way up Mazourka Canyon and entered Badger Flats, without much anticipation of an actual meeting along the lines of Moses’ encounter on Mount Sinai. From Badger Flats, we started a loop that initially heads back towards Papoose Flats. This section of road got a little rocky and rough in places, but it was a lot of fun and the views off to the Sierra were pretty expansive in several spots. Papoose Flats was a really cool place – remote, scenic and tad-bit unusual. It’s a fairly wide flat with large, isolated granitic boulder formations spread out across its extent, which had a somewhat other-worldly feel to them. If it wasn’t for all the sage and other desert brush, which makes me feel right at home, Papoose could almost start to resemble an alien landscape. We had lunch in Papoose Flats before heading over to Squaw Flats, another pretty and isolated area nestled deep in the Inyos. The trail was pretty sandy getting over to Squaw, but then there was a fast, fun section of trail right through Squaw Flats that led to a hill climb of sorts on the far side. I had a blast trying to keep up with Curtis through this part as we weaved our way along to the far side of Squaw Flat. However, it made it go by too fast! It was nice to visit Squaw Flats again because it brought back some good memories. Rebecca and I drove back there quite a few years ago to hike up Waucoba Peak and Squaw Peak with Rosco and Daisy. We all really enjoyed that one. Gotta say, sure was a lot easier getting back there on a dirt bike, though! From here, we headed out to the 178 highway and then circled back through Harkless Flats before returning to Papoose Flats. I’d love to get back to Harkless Flats to explore around some more. The crest between Papoose and Harkless had yet more great views of Owens Valley and the Sierra. The clouds were building above the Sierra by this point and a swift wind was picking up over the Inyos. When we got back to Badger Flats near the top of Mazourka Canyon road, Curtis and Mark had to head back home to Ridgecrest and take care of some family business. Since I drove up separate, I decided to stay and ride on up to the top of Mazourka Peak and check out the views, which held some promise for being some of the best that day and, indeed, they certainly were. I found a couple of really nice on-the-edge-of-the-world camp sites up there that are still on the to-do list for one day! I got off my bike, took off the helmet and some gear and relaxed for a while in this awe-inspiring location. I love crisp, cold mountain winds. They feel almost cathartic and enlivening as they purify, carrying away any concerns, frustrations, or any other emotional tensions, with each gust. I rode back down the mountain feeling re-invigorated. Next up, I decided to try getting out to the Betty Jumbo Mine, one of those more obscure locales. 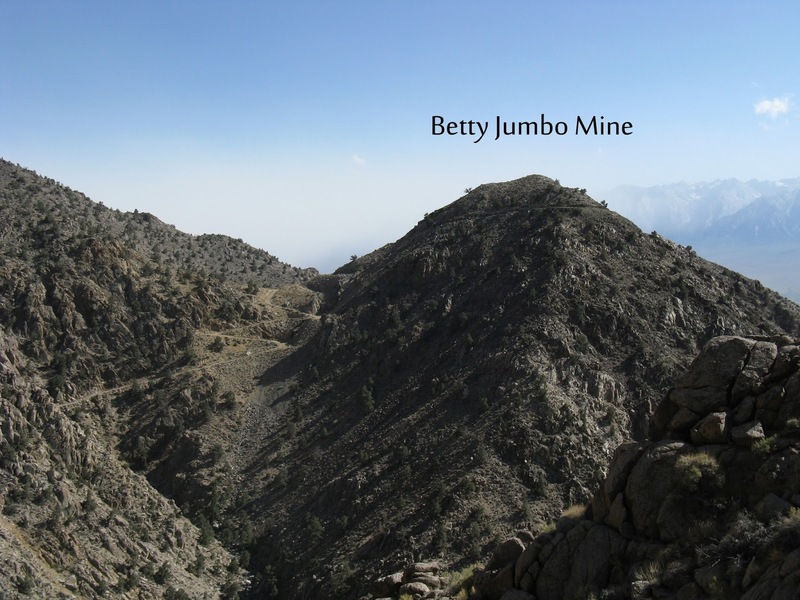 The road to Betty Jumbo follows a narrow road that precipitously snakes its way along the side of the Inyos for about 9 miles, with a lot of steep, rugged mountainside stretching far above on one side and far below on the other. Frequent large, fallen boulders lay across the middle of the road. It’s always neat getting to these antiquated, rarely-visited old mining sites. Since the mine site was separated off a bit from the main mountain massif and out on an isolated sub-peak, it made for a nice lookout with views stretching up and down Owens Valley below. One can quickly feel tiny and insignificant in this vast landscape. I’ve been regularly eating a couple breakfast meals that now rank amongst my favorites since starting to eat a bit healthier. These are the Protein Quinoa Bowl and Chia Seed Cereal. They’re both Julie Morris recipes, albeit with perhaps a few small modifications here and there. She rightly calls the Protein Quinoa Bowl the ugly-duckling of breakfast bowls. That, however, must make the Chia Seed Cereal the fugly-duckling of breakfast bowls. The unappetizing green color is mostly caused by the Hemp Protein Powder found in both cereals. Surprisingly enough, they are both delicious and very satisfying. I like them both a bit before, or after, a good workout, because they are easy to digest and leave you with a light feeling, even though they provide energy for hours. No doubt, you have probably heard the Chia Seed Cereal mentioned before if you have read some of my other blog posts. I often take it with me on my trips for an early morning energy source, before a good hike or ride. First, let’s start with the Protein Quinoa Bowl. This is a hot meal and best during the cooler months. Like I said above, it doesn’t look super appetizing. But, don’t let looks fool you! If you like the taste of almond butter and maple syrup, topped with a little banana and cinnamon flavor,well you’re probably going to like this hot cereal. Let’s start with the ingredients. Bring the Hemp Milk to a boil in a medium saucepan. Then, stir in the Quinoa Flakes and turn off the heat and let sit for about three minutes, allowing the Quinoa to cook through. Next, add in the remaining ingredients and stir until smooth. Dish into your favorite bowl and add sliced banana and Cinnamon Powder to your liking. Next, prepare to be amazed how yummy this ugly-duckling of breakfast bowls can taste. Don’t forget to go for a work-out and feel the endurance! I should also note that Maca can also provide a bit of energy. At the same time, it’s also a powerful adaptogen, making for a “calming” energy while regulating stress, if that makes any sense. Incan warriors used to eat Maca before going into battle to increase both strength and stamina during long battles. However, given it’s libido enhancing effects, the women of the tribes demanded the men not be allowed to eat it during times of peace, so they could have some piece and quiet. Next up – Chia Seed Cereal. This is best cold, or even at room temperature, which I actually prefer. Also, if you need more fiber in your diet this is the cereal for you. The 3 tablespoons of Chia Seed Cereal contains 15 grams of fiber alone! Hemp Protein is a fairly rich fiber source, too. So, it may be best to start out with 2 tablespoons of Chia Seeds and see how you handle it. Either way, you probably don’t need a whole lot of fiber for the rest of the day. As mentioned, I find the Chia Seed Cereal very easy to digest, despite the fact that other high-fiber meals may be a bit more of a challenge. In addition, since the Chia Seed absorbs the Hemp Milk and becomes “gelatinous”, it’s also helps detoxify your system. I’ve also read that Chia Seeds can help with extended hydration during exercise, due to this moisture absorbing property. To be honest, I haven’t really noticed a difference here, myself. Lets start out with the ingredient list again. I also like to add dried dragon fruit when we have it around. Start out by adding everything but the Hemp (or Almond) Milk into a large bowl. Then, pour in the Hemp Milk and stir well. Let this sit for about 15-20 mins. It doesn’t hurt to occasionally stir during this period, but it’s not necessary, either. When ready, give it a final stir and add some banana slices and Cinnamon Powder to your liking and enjoy. Once again, it doesn’t look very appetizing, but I personally think it’s pretty yummy. I gotta admit though, when Rebecca first introduced me to this one, I was a bit frightened to try it. I think it took a few times to acquire a taste for it, as well. Who knew it would turn into a fairly regular meal! I’ll also sometimes have a small glass of “chocolate” milk with these breakfasts. It’s as simple as adding one scoop of Amazing Grass Chocolate Infusion Greens Powder to an appropriate amount of Hemp (or Almond) Milk. The powder is made from Cacao, which is an unprocessed, unsweetened and healthier form of “chocolate”. In fact, it is one of the most anti-oxidant rich foods known. If you need a little more protein you can throw in 1 tablespoon of Hemp Protein, but this does alter the taste quite a bit. I wanted to share my view on faith, which was partly summed up so well in a series of Alan Watts quotes. Living in a predominantly Christian society, it seems most folks equate faith to simply believing in Jesus. Don’t get me wrong, I ultimately consider myself a Christian. However, I think this view has a tendency to forget that Jesus also taught inner transformation and self-knowing, as all religions do. Also, it is a mutually exclusive view, which seems sort of hard to reconcile these days, since fields like comparative mythology and psychology have shown that all religions are saying the same thing. It’s also very hard to reconcile with what comes out of the Near Death Experience and the Mystical Experience, as they are reported out of all cultures and religions around the world with the same consistent, universal and inclusive themes and messages. I view faith as a stepping stone to experience, meaning we’re not talking about a “blind faith” here. Faith is an opening of the mind to a deeper reality that one can eventually come to directly experience, here and now. I know this might sound strange, as most of us aren’t familiar with the idea, or the possibility, of a direct experience of God, or the ground of all being, while still alive. But, this is what ultimately comes out of the teachings of religions worldwide. In reference to all the literature and scripture discussing the nature of this transcendent, yet immanent, experience, Aldus Huxley called it the “perennial philosophy” and Alan Watts called it “a single philosophical consensus of universal extent”. One can also simply call it a spiritual awakening, which typically requires first being open to the possibility of having a spiritual awakening. In the Gospel of St Thomas we hear, “The Kingdom of Heaven is spread out upon the Earth, but men do not see it”. The good news, which is the meaning of “gospel”, is that we can learn how. It all starts with faith! If you’re interested in more Alan watts, here’s a lecture by him on Christianity I really enjoyed. ”’Be ye warned, ‘dem Flats be haunted with the restless, angry ghosts of old-time Death Valley miners“. That’s along the lines of what some enigmatic Internet personality named Dingus Milktoast once dramatically told me about Lee Flat – a semi-remote spot in Death Valley NP, which also happens to be one of the more impressive Joshua Tree “forests” in California. I don’t know if that factored into my decision on whether to drive out the night before my ride and spend the night in Lee Flat or leave really early in the morning instead, but I ended up going with the early morning departure. When I arrived to the turn off for Lee Flat the next morning, Wild Burros were hanging out in the area. Most burros I have seen in the past either barely take the time to look up and acknowledge your presence, or they just stand there and keep a leery eye on you until you leave. These three guys were jittery and booked it quite a ways before finally turning around and staring me down with much trepidation. Between that, the low light and incorrect camera settings, I didn’t get the best picture. Still though, any wildlife pictures are always a gem in my mind. Aren’t their white noses cute? I found a nice camp site in Lee Flat and spent a few minutes watching the desert come alive as the first rays of light made it over the mountains shortly after I arrived. Perfect timing! My original plan was to do a loop through Death Valley that I have been wanting to do for some time. So, what are the chances the government would shut down right before I go and decide to shut down the desert too? Quite ridiculous, but that’s what happened. Anyhow, I picked a new ride that still went through small parts of Death Valley, but at least I wouldn’t be quite as blatant about it. Plus, if I broke down, maybe I’d have a chance for a rescue! My new plan was to explore some lesser known roads that climb up into the Inyo Mountains. One led up to the Bonham mine and was just north of and parallel to the Cerro Gordo road. This one wasn’t too bad to get too, but the bottom of the road leading to Cerro Gordo was gone, washed away in a flash flood leaving behind a bunch of rocks and debris. This made for about a 1/2 mile of interesting wash riding before getting to the Bonham mine road proper. The second road was south of the Cerro Gordo road. On the map it looked to go all the way to Cerro Gordo, but I only made it to about a 1/4 mile before the Belmont mine. If I had company I would have gone further, but it was getting rougher than I was comfortable with being solo. This was yet another road that appeared to be damaged from the heavy rains this year. Both areas were real pretty and it was fun to visit these secluded spots. From here I had a blast on a long, fast stretch through Santa Rosa Flat that led back down to the 190 highway. I crossed over and made my way down towards the northern edge of the Navy base. The plan was to head down Centennial Canyon (rocky!) to Upper Centennial Flat (more rocks!) and the Navy base boundary. From here, I would loop around over into Joshua Flat (even more rocks! ), nestled back in the Coso Range. It was pretty obvious nobody has been back here in a while. The only tracks in the canyon were burro tracks and the road was almost non-existent in spots in Upper Centennial Flat. There were so many burro tracks (and burro poop!) in some spots I was surprised to not run across some more. I had a bit of a navigation snafu back here too. (Snafu means “a badly confused or ridiculously muddled situation”, which seems to sum up best what happened!) I thought I had already crossed Joshau Flat and was climbing up to a saddle on the far side when I crashed and ate it in some rocks. Being rather remote, this made me a bit nervous. So, as I lay there with the bike still on top of my leg, I made the decision to turn around and head back. Later on, I found out I was only climbing up to the saddle between Upper Centennial Flat and Joshua Flat and still had 5 miles left to get to where I thought I was in the moment. In retrospect it all seemed pretty obvious. Ah well! 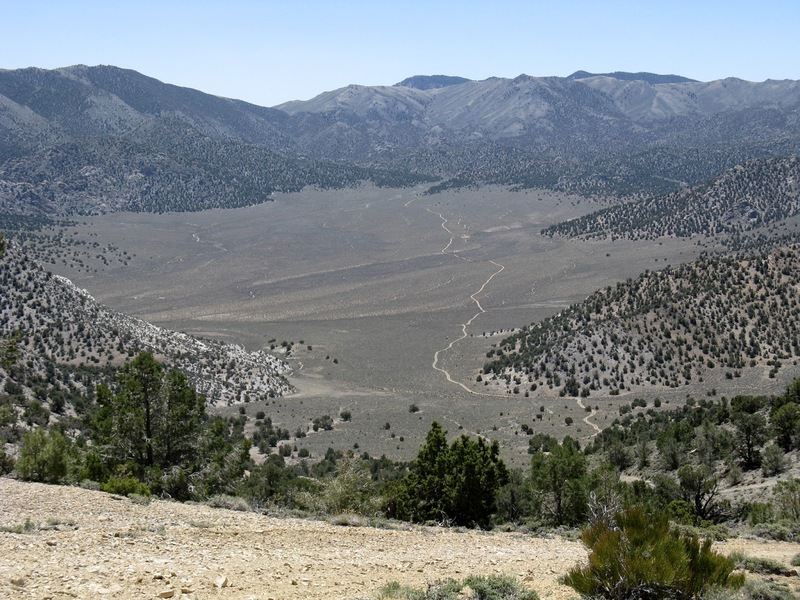 Joshua Flat will still make for a nice adventure to a rarely-visited and scenic area for a future trip. Maybe next time I will see some burros, or even wild horses, which also roam the Coso Range. After this, I started heading back towards camp with the plan to stop at Talc City and check out some of the old mines. There wasn’t much to see, but I found a really nice spot up on a hill to enjoy the views and have lunch. After Talc City Mine, I hopped on the pavement for a bit and headed over to the Saline Valley Road where I cut back towards Lee Flat again. On the way, I visited the the Box Car Cabin, located just before Lee Mines. This was a neat cabin that had several pieces of artwork, both outside and inside. Always neat the unexpected things one can come across in the desert! After the Box Car Cabin, I rested for a bit back at my camp before setting out for the next destination. This was a little spot I’ve been thinking about since first visiting this area back when Rebecca and I hiked up Nelson Mountain. It looked like the road we drove in on then may have kept going back to a potentially killer view of Saline Valley. Turns out it did just that and the photos don’t do it justice. I think the views from here were probably better than from Nelson Mt itself. There was a great campsite here too that we’ll both have to come back to one day. Last stop was the Nelson Mountain Cabin. Another spot Rebecca and I skipped over after our hike years ago. I didn’t get to see much this time, either. There was a Hantavirus warning so I made a retreat in fairly quick order! I headed back to camp and relaxed with a couple cold beers, while listening to the wind rush through the nearby Joshua Trees. It was the only sound the desert was making and it was quite peaceful to listen. I became mesmerized watching the especially contorted shapes of some other Joshua Trees rustle in the wind. They looked almost uncomfortable and resistant as if the wind was causing them pain. Joshua trees have quite a personality at times. Overall a great day! Only regret was being too tired to join Rebecca for Alabama Hills the next day. I wasn’t originally planning on writing up a blog post on this particular trip, but since this will probably be my last Sierra trip of the season, it’s looking like my last chance to write up any others. The original plan was to hike/climb up Little Lakes Peak and Mount Morgan with Charles and Jay. However, my ankle was starting to get irritated once again as the summer wore on. Although, I suppose it has done better than prior years, since I was going every weekend this summer, with no rest up until this trip. We all met up there the night before and I still wasn’t sure what I was going to do. The originally planned hike/climb sounded exciting and was something I have been wanting to do for a bit. In addition, it had been a while since I hiked with either of those guys. In the end, I decided to play it safe and just do a small jaunt to Ruby Lake, which is only about 4.5 miles round trip. I started up the trail with Charles and Jay, until the junction with Ruby Lake. I wished them good luck on their climb and started up the lovely Ruby Lake trail in the morning light. The air was crisp and cool and the early morning sunshine seemed so clear and bright to be almost ethereal. I enjoyed the views down to Little Lakes Valley, while listening to the birds chirp their morning tunes. When I arrived at Ruby Lake, the views were as gorgeous there as usual. I started checking out Lookout Peak – a small peak in the area I had already climbed over 10+ years prior. As usual, I couldn’t help myself and just relax at the lake. I almost immediately started scheming about a new potential route up Lookout Peak I could take. So, I contoured up grassy benches around the North side of the peak and there looked to be various ways up to the lower northern summit on this side, ranging in difficulty from 3rd class to 5th class. I eventually went up a nice solid rib that could either be called the NE ridge or NE face. It had some stiff class 3 moves down low, but it wasn’t exposed. The rest of the climbing was easy Class 3 to pleasant Class 2 boulder hopping near the top of the lower northern summit. I then traversed over to the higher southern summit enjoying views of Ruby Lake down below. After enjoying the views on the summit and having a snack I descended down the SW ridge of the peak, leaving me at the little meadow above Ruby Lake and below Mills Lake. After lookout peak, I rambled around the little basin just below Mills Lake scouting for any wildflowers, or other photographic opportunities. The flowers were pretty lean and most were on their way out for the season, but I found a few nice patches of Columbine. I also had fun playing with color accent feature on the Canon G15 again. You can see the before and after on one particular type of (but not exact same) flower below. After aimlessly wandering around for quite some time up there, I figured I had better head down to meet Charles and Jay. I tried to time it so that if they moved at a decent pace, we would probably arrive back at the same time, or at least with me slightly before them. When I got back to the car, it was just me, but that wasn’t too surprising. Mountain climbs can often take longer than expected. So, I cracked open a Mammoth Brewery 395 Pale Ale and relaxed by the nearby stream. More time went on and my beer bottle eventually ended up empty. Why not have another to pass the time, I figured. This process repeated itself until I finished all four Pale Ales I brought along and also started to get concerned because of the time. When the clock hit 6PM, I started to think that even at the slowest pace they should be back by 7PM. I decided that if they weren’t back by 9PM something bad must have happened for sure and I would head down to call for help. Much to my relief Charles came off the trail around 6:45, with Jay about 10 minutes behind. Phew! They were fine and had a good day – the climb just turned out to be a bit more involved than anticipated. We all headed down and had a delicious burger and fries at Jack’s Restauarant. Sometimes the best part of a day in the Sierra is the delicious dinner afterwards, while toasting off a great day with a couple beers! Jay and I headed back to Ridgecrest and Charles headed up North for one more climb the next day. It was a nice day for all of us. We often walk around with ideas we regard as facts, which in actuality are false. Recently, an article was published showing that two thirds of Americans mistakenly believe we only use 10% of our brains, which is now known to be false. A significant number of people still regard as fact that creative folks are right-brained and analytical folks are left-brained, which has also been shown to be false, starting with a study done at the University of Utah. These ideas are both “myths” in the simplest sense of that term. Their continuing presence is, however, quite natural and expected. As science progresses, it either refines or negates existing theories, eventually replacing them with more accurate ones. In the meantime, old ideas do linger for a while. However, there is an even more subtle source of mistaken notions. This source is our worldviews, which are images of reality we form as a culture that enable us to operate in the world. This corresponds to the broader meaning of “myth” as it is used in comparative mythology and similar fields. Rather than showing up as one simple incorrect fact, these manifest as paradigms under which the whole of society operates, including science. The paradigms influence not only how we view a problem, but what we think the form of the potential solution must come in. Worldviews are always self-limiting, but we do not let go of them easily. The dominant worldview, or myth, within Western society is materialism, which typically holds to some basic assumptions, such as physicalism (‘everything is physical’), reductionism (‘sum of its parts’) and objectivism (‘reality exists independent of consciousness’), as far as science goes, but ultimately even leads to other ideals like consumerism and the accumulation of wealth. This isn’t too say materialism is inherently wrong, but rather self-limiting and incomplete like all worldviews have historically been. Being under the influence of this materialistic worldview, many of us would immediately assume that the brain must be the source of consciousness. As Richard Dawkins so bluntly stated, “We are all biological meat robots“, or as AI pioneer Marvin Minsky said, “The brain is just a computer made of meat“. However, since we have no idea how consciousness actually works, these are assumptions, not facts. Since memory is an aspect of consciousness, the automatic assumption would be that it too must be sourced somehow by the brain. Indeed, most theories in neuroscience generally assume that memory is somehow encoded within the structures of the brain. However, neuroscientists have had a hard time pinning down just how this happens, with some studies indicating that memories are stored across the entire brain, as if stored in a fashion similar to a hologram. Further, Near Death Experience (NDEs) research and Psi (psychic ability) research seem to indicate that memories are stored external to the brain. Reputable guys like Rupert Sheldrake have gone as far as coming up with theories like his Morphic Resonance, which is a kind of consciousness-as-a-field theory, where the brain acts more like a filter/transceiver of this field. Even such noted folks like Roger Penrose are considering ideas where consciousness may be a fundamental and irreducible aspect of reality. Indeed, the number of individuals starting to look at ideas beyond the typical mainstream, materialistic views is growing, at least in part because explaining consciousness under the materialistic paradigm has made very little progress. The so-called “hard problem” of consciousness – that is, how does subjective, inner experience (i.e. qualia) arise from unconscious, inanimate matter – remains completely unsolved to this day. However, more and more studies are coming out of the mainstream that also hint at a potential science beyond materialism. The point of this blog post was to introduce one of these studies. For example, one would assume that if memories are really stored in the brain, decapitation would eliminate those memories. This is rather difficult to test for in humans, but not so difficult with flatworms (planaria), since they can regrow a head! The results of a recent study (full text below) seem to strongly indicate that memories are not solely stored in the flatworms brain. It’s possible the memories here are stored in some kind of “cellular memory” within somatic tissue and I am sure they will exhaust what will be considered more pragmatic explanations before jumping to something like Morphic Resonance. However, when these results are considered alongside the results coming out of Psi research, I think this make it more compelling for us to begin to consider the possibility that memory is not only stored external to the brain, but even the body, thereby allowing non-materialist theories like Morphic Resonance to be considered a valid, competing hypothesis for attempting to explain memory formation/recall. “(Phys.org) —Tufts University biologists using new, automated training and testing techniques have found that planarian flatworms store memory outside their brains and, if their heads are removed, can apparently imprint these memories on their new brains during regeneration. The work, published online in the Journal of Experimental Biology, can help unlock the secrets of how memories can be encoded in living tissues, noted Michael Levin, Ph.D., Vannevar Bush professor of biology at Tufts and senior author on the paper. “As bioengineering and biomedicine advance, there’s a great need to better understand the dynamics of memory and the brain-body interface. For example, what will happen to stored memory if we replace big portions of aging brains with the progeny of fresh stem cells?” said Levin, who directs the Center for Regenerative and Developmental Biology in Tufts’ School of Arts and Sciences. Planaria have a remarkable capacity to quickly re-grow new body parts, and decades-old research on planarian learning had suggested that memory can survive brain regeneration. 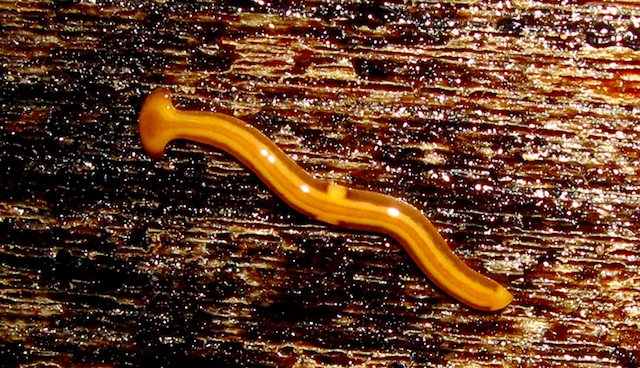 Difficulties inherent in complex and tedious manual worm training experiments contributed to planaria falling out of favor as a model for such research, but the new automated training system developed by the Tufts researchers may reverse that. “We now have a reliable, state-of-the-art approach that moves beyond past controversies to identify quantitative, objective, high-throughput protocols for studying planarian long-term memory capabilities,” said Tal Shomrat, Ph.D., first author on the paper. A former postdoctoral associate with Levin, Shomrat is now a postdoctoral researcher at the Hebrew University of Jerusalem. “I believe that investigating this unique animal that displays relatively complex behavior and can regenerate its entire brain in only a few days will provide answers to the enigma of acquisition, storage and retrieval of memories,” he added. Shomrat and Levin focused their attention on planaria of the species Dugesia japonica. One planarian group lived in containers with a textured floor while the other was housed in smooth-floored Petri dishes. The worms, which naturally avoid light, were then tested to see how readily they would eat liver in an illuminated quadrant on the bottom of a rough-textured dish. Automated video tracking and subsequent computer analysis of the worms’ movements (image above) showed that the group familiarized to the rough-floored dishes overcame aversion to the light significantly more quickly and spent more time feeding in the illuminated space than did the non-familiarized group. Both groups of worms were then decapitated and housed in a smooth-floored environment while their heads regenerated. Two weeks later, the fully regenerated segments were again tested. Worms regenerated from the familiarized group were slightly but not significantly quicker to feed in the lighted part of the container. However, when both groups of worms were given a brief refresher session of feeding in the textured environment, then removed and retested four days later, the planaria generated from familiarized segments were significantly quicker to feed than those regenerated from unfamiliarized worms—showing that they retained recognition of the link between this type of surface and a safe feeding environment.